Hey – guess who showed up over 2 weeks late with her big bag of cramps? That’s right…my Lady Time arrived today and she has got an AT.TI.TUDE!!! Oh, and to make it even better, I have nary a sanitary napkin* or any other product of feminine hygiene. Lovely. It’s a damn good thing this is a 3 day weekend. *Why is it called a sanitary napkin? It’s neither sanitary nor a napkin. Discuss. Yeah – sanitary napkins. Whatever LOL. “Sanitary napkins” — I haven’t heard them called that since the awkward junior high “Becoming a Woman” class lecture about puberty. I can’t believe marketing execs named that thing the iPad. 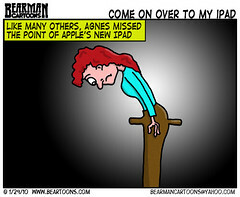 You KNOW someday technology will come up with the wiiPad (yes, I just made that up). I think they’re called sanitary napkins because like, a billion years ago, women used to use actual fabric napkins when they had their period, which they had to soak, wash, dry and re-use. Or they would use old rags (hence the term “I’m on my rags”). I suppose the word sanitary is there because the general idea is to keep your lady parts clean and free from germs.